We designed and installed this garden on The Arlington in Kensington about a year ago. The homeowner is a real estate agent and wanted his house and garden to have some major drama and curb appeal. The home is kind of a storybook/Tudor style, painted a sage green with brick front porch and entryway. 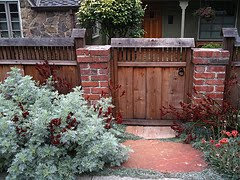 We added some large flagstone slabs for the path in a pink color to match the brick, and put in a raised bed along the inside of the fence out of dry-stacked moss rock to give the planting height so it would be more visible. 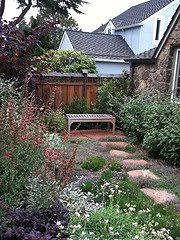 The house style and size of the garden really called for planting that was informal, small-scale and cozy and also really colorful. 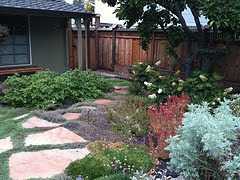 This "cottage-style" usually implies lots of maintenance-heavy flowering annuals and perennials planted closely together. But the resident neighborhood deer had to be considered when selecting our plants because the fence around the front garden was so low they could jump right over. So we opted for yucky-tasting but showy Mediterranean flowering perennials such as salvias, agastache, thymes, in addition to some Austalian/New Zealand aromatic or furry-textured plants that deer leave alone, like kangaroo paws and leucodendron. 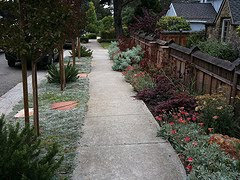 The low-growing silver plant with orange/red flowers is arctosis. 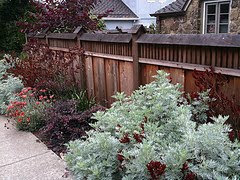 The mass of silver foliage is artemesia. 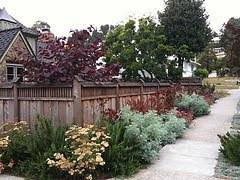 The dark purple foliage we added in for color and contrast without having the maintenance of dead-heading flowers. The street trees are crepe myrtles.